Missionary Alvina Federwitz and her late husband, Rev. Dale Federwitz, began their missionary career with the Lutheran Bible Translators in 1971. Their first placement was Bible translation with the Mandingo people of Liberia. They also supervised the Kuwaa translation and literacy project until completion of the New Testament in 1988. Alvina and Dale served as mentors to the Liberians who formed LIBTRALO (Liberia Translation and Literacy Organization) in 1995. They continued as coordinators, translation, and literacy consultants to languages in Liberia and Cameroon. Dale was diagnosed with cancer, and entered the gates of heaven in July 2002. Alvina then attended the Graduate Institute of Applied Linguistics in Dallas, Texas, to pursue advanced training in literacy and literature development. 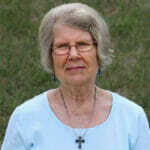 She continued work with LIBTRALO and also as advisor to church literacy programs in Ghana until summer of 2015. Alvina returned to the U.S. and served as Mission Participation Coordinator for LBT. She retired from full-time service in 2017, but continues to serve in an adjunct capacity, assisting LBT’s executive development officer.